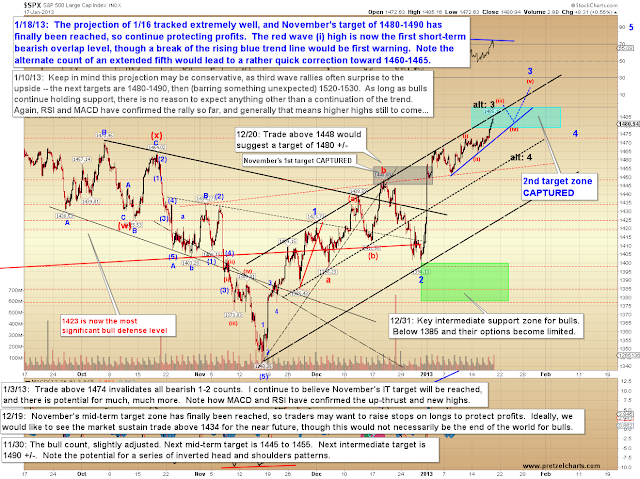 Wednesday's update noted that SPX 1467.56 should serve as a dividing line between a deeper correction and a trip directly into my long-standing target zone of 1480-1490. Amazingly, the market found a bottom at 1467.60 , then proceeded to rally up to 1485 (somebody out there nailed a perfect risk/reward trade entry!). 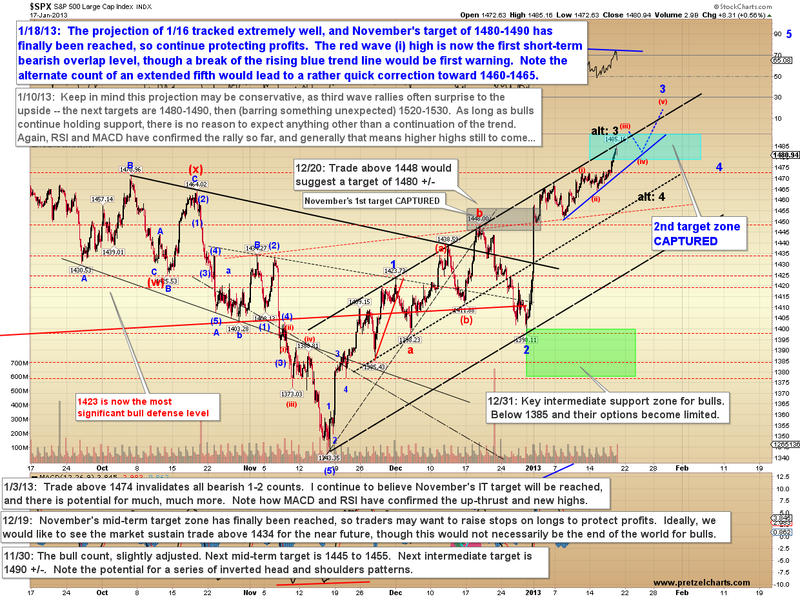 Note the 32 point trade trigger of December 20 was also finally captured in the process (1448 to 1480). Going back to November's updates, there was one big scare along the way (when 1411 broke) which switched my public stance to neutral, but all the blue target boxes since November have now been reached. Even before the fiscal cliff scare, my "safe" target of 1445-1455 had already been captured; so all told we've captured a bit over 100 points of the rally since November 19, 2012. Which brings me to a thought I'd like to share with readers: My biggest complaint with myself from the recent past is that I didn't stick to my bullish guns in the updates during the fiscal cliff scare... and I'll tell ya' exactly why I didn't, too: simply because I'm not so arrogant as to think I'm never wrong. 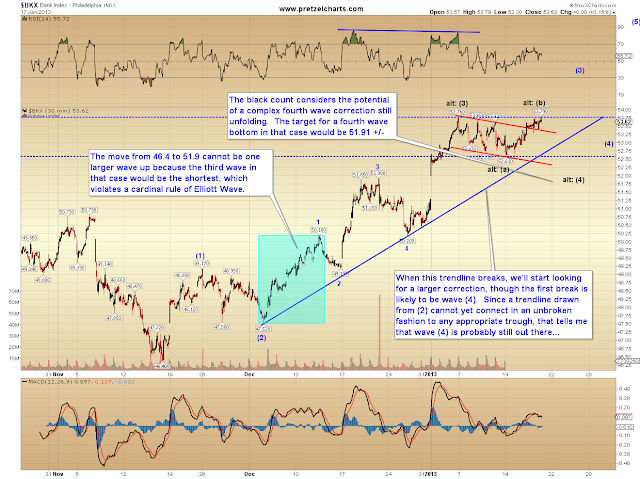 With the market in that position, with a big third wave decline as a very real potential, I worried about "convincing" anyone to go long and possibly having my readers get caught on the wrong side (if I was wrong). So I switched myself to neutral publicly, because that was a dangerous position for the market, and especially dangerous for cash traders. Privately, I remained bullish. In retrospect, obviously, I wish I had stayed more publicly bullish. It's a tough gig. Losing your own money is one thing, and I view that as part of the game... but feeling like you "lost" someone else money is almost unbearable at times. I've lost sleep on many nights over this -- and not just when I'm wrong. Sometimes just when I'm bold and worried about being wrong and misdirecting someone. Respect to the brokers in our audience -- you know who you are! In any case, the question now, of course, is: what next? Well, I don't get 'em all right, so I can't promise anything, but it does appear that SPX still needs a higher-degree fourth wave correction and fifth wave up, at the minimum. As always, once a target zone is reached, reversals become a bit higher probability. There are some indications that the rally could be nearing a turn, but as I've been noting all month, this is a third wave rally, and third waves love to blow up everyone's favorite indicators (this is actually why I haven't been publishing much lately about divergent sell signals and such -- those types of technical indicators rarely work during third waves). The traditional count is outlined in red, but the alternate count is not at all unreasonable and would be suggested with trade beneath the red wave (i) high. The Philadelphia Bank Index (BKX) is also hinting at more upside after the next correction. Note the pattern here, and an upside breakout over the dashed blue line should lead to 54.80-55. In conclusion, as I've mentioned since the beginning of the year, I have no intention of trying to call a top in this wave until I see the first impulsive decline. That said, a long-standing target zone has been reached, so it's time for traders to decide whether to take profits or chase the move higher with stops. Trade safe. Pretzel, to my mind you outlined your projections with great clarity. As I understood it your bullish "bias" was always evident but you felt the need to point out that the market at the turn of the year was at a key inflection point and had the potential to turn on a dime, so traders should be cautious. You can't say fairer than that. seen this site. He has good stock trading advice.